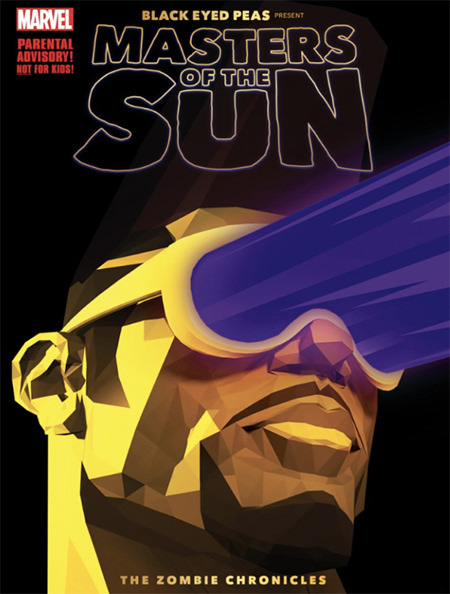 Black Eyed Peas will release first ever augmented reality app for their acclaimed graphic novel Masters of the Sun : The Zombie Chronicles on Black Friday November 24 via Marvel Comics. It features the voices of JAMIE FOXX, STAN LEE, RAKIM, QUEEN LATIFAH, COMMON, MICHAEL RAPAPORT, ROSARIO DAWSON, ICE T, SNOOP DOGG, REDMAN, CHARLAMAGNE THA GOD, MARY J BLIGE, FLAVOR FLAV, RAEKWON, KRS ONE, JADEN SMITH, SLICK RICK, JOHN DIMAGGIO and JASON ISAACS. The will.i.am created graphic novel is a futuristic B-Boy meets L.A gang culture meets Egyptology themed Zombie thriller that was released to much acclaim in August of this year and will now be brought to life with the ground-breaking AR featuring the voices of some of Hollywood and hip-hop’s most crucial artists. The app will also feature narration by 95 year old legendary comic icon Stan Lee and a score co-produced by both BEP member will.i.am and Academy Award winning composer, Hans Zimmer (Dark Knight Trilogy, The Lion King). Set for release on both iOS and Android mobile platforms, the Masters of the Sun Augmented Reality app will retail for $1.99. The standalone graphic novel of Masters of the Sun: The Zombie Chronicles released last summer is currently available for purchase at bookstores and online retailers (Amazon and Barnes & Noble) and Marvel Comics.